The details presented came from a draft of the University’s new Institutional Master Plan for Allston, an official blueprint that Harvard will submit to the Boston city government next week. The IMP draft lays out nine major proposals for Harvard’s property in neighborhood across the Charles River. It also outlines the face-lift of Harvard Stadium, the renovation and erection of several Harvard Business School buildings, and the construction of a hotel and conference center near the current Charlesview site. 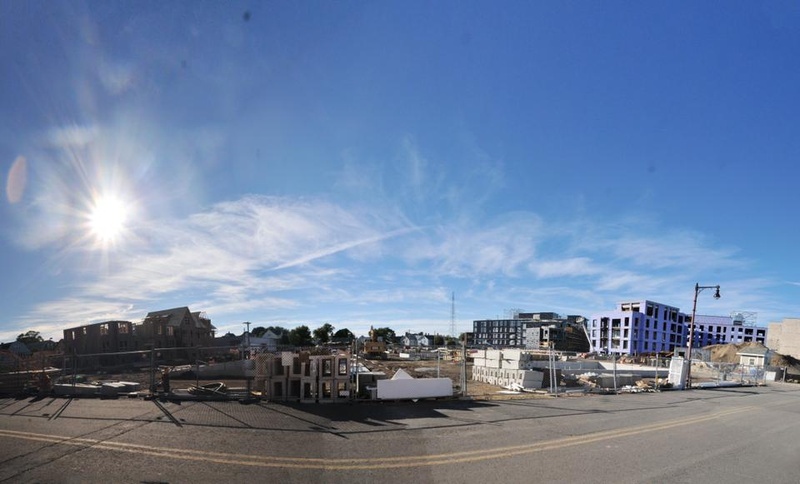 In addition, it designates a parcel of land in North Allston as a “mixed-use” parcel to be used for future University and community development. Kevin Casey, Harvard vice president for public affairs and communications, stressed an oft repeated point that the new IMP draft is a “recalibration” of the previous IMP, adapted to a shorter, more practical time frame. “This is an ambitious, doable, 10 year project—a major, transformative agenda for this area for the next 10 years,” Casey said. This new blueprint comes five years after Harvard filed its first Institutional Master Plan for Allston development in 2007. The plan envisioned, among other things, the creation of a massive, $1 billion science complex and the transformation of Barry’s Corner into a vibrant community center. However, Harvard halted its pursuit of the lofty goals of this 30 to 50 year plan during the financial crisis of 2009. Not until 2011 did the University officially resume its Allston planning process. The new blueprint will not include plans for the Barry’s Corner Retail and Housing Common or the re-imagined Science Complex. The Science Complex was already approved under the old Institutional Master Plan, and the Barry’s Corner project will need approval in a separate process that has not yet occured. Jeremy L. Gibson, senior associate director of Harvard Athletics, said that the new basketball stadium, to be built between 2017 and 2022, will provide more seats for a program which has garnered increasing attention over the past few years, peaking in Harvard’s first appearance in the NCAA tournament in 66 years last spring. Since coming to Harvard in 2007, men’s basketball head coach Tommy Amaker has led the Crimson to a 92-56 record, including back-to-back Ivy League championships. The Harvard basketball program stepped into the national spotlight more than ever before in 2012. The Crimson won the Battle 4 Atlantis, a pre-season tournament in the Bahamas, last November before winning the first outright conference championship in program history and spending time ranked in the Top 25 en route to its first March Madness berth since 1946. Harvard sold out every home Ivy League game last season in Lavietes Pavillion, which has been the home of Harvard basketball since 1982. With a seating capacity of 2,195, Lavietes is currently the second-smallest basketball arena in the Ivy League, just 95 seats larger than Dartmouth’s Leede Arena. Harris S. Band, Harvard’s director of physical planning, said that the creation of a new basketball venue, as well as the other projects, would not only serve the University but would also benefit the larger Allston community. Allston community members were skeptical of the placement of the University’s new basketball center, which they feared was too close to the residential section of the neighborhood. Harris acknowledged Mellone’s point, and said that the University would continue conducting analysis to ensure that the new buildings fit as seamlessly as possible into the new community. After Harvard files its new plans, community members have the opportunity to give feedback on the plan during the next 30 days. Harvard will then resubmit the plan to the Boston Redevelopment Authority, and after a 60-day commentary period, the BRA and the Boston Zoning Commission will decide whether or not approve the final IMP. An earlier version of this article incorrectly stated that the Barry's Corner Housing and Retail Commons project was approved under the old Institutional Plan for development in Allston. In fact, it will have to go through a separate approval process that has not yet occured. In addition, the article also incorrectly attributed a quotation about the interaction of sports facilities and the local community to Harvard-Allston Task Force member Paul Berkeley. In fact, Task Force member Bruce E. Houghton was quoted.